With years of experience in ESL (both teaching in schools and recruiting staff), our staff have a combined experience of over 20 years teaching English as a Second Language. 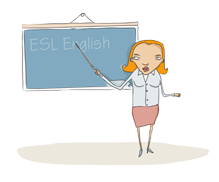 Having taught all over the world including countries such as Kuwait, China, South Korea, Japan, England and Germany, we are very knowledgable in the ESL field. We started this site in 2002, trying to provide a resource where teachers could post their job offers, and native English teachers could post their resumes. We hoped to make a clear and easily read website that would sucees in bringing together teacher and jobs together in the ESL industry. Our website has continued to grow year after year, and we are proud to have one of the leading ESL job boards on the internet. Find your dream English teaching job, or find the perfect teacher to fill your vacant teacher position. All for free, on ESLJobs.biz.